During the procedure magnetic therapy uses artificially generated magnetic field. They affect the body in a special way, thus restoring the disrupted biorhythms, and the General condition of the patient is normalized. Magnetotherapy has strong anti-inflammatory and anti-edema effect, it effectively reduces pain symptoms of different origins. For therapeutic purposes, magnetic therapy, is prescribed for diseases of bones and joints (arthritis, bursitis, etc.). Treatments accelerate the healing of bruises and coalescence of fractures. Arthritis magnetic therapy effectively relieves the pain and swelling, improves the supply of nutrients to the cartilage. Magnetic therapy is prescribed for the treatment of spinal diseases: osteochondrosis, radiculitis, spondylosis, treatment helps to cure inflammation and remove the spasmodic phenomena. This form of physiotherapy is used in diseases of blood vessels: venous insufficiency, thrombophlebitis. Magnetic therapy for reviews promotes rapid healing of wounds and ulcers, relieves allergic reactions on the skin. Magnetic therapy improves blood circulation, has a rejuvenating effect. In the appointment of magnetic therapy should be considered contraindications. This procedure may be the cause of ill health. Magnetic therapy should not be prescribed for hypertension in severe, acute forms of circulatory disorders, endocrine diseases, heart diseases (heart failure, arrhythmia, and others), in malignant processes. Contraindicated therapy of magnetic fields with the active form of tuberculosis, in the presence of the patient's pacemaker, with increased risk of occurrence of bleeding in acute mental disorders, infectious diseases in the active form, with systemic blood diseases, alcohol intoxication, the sudden General exhaustion. Magnetic therapy harmful for thrombosis and thromboembolic complications, in any state, accompanied by increased body temperature, diseases of the Central and peripheral nervous system in acute and chronic diseases of the genitourinary system (prostatitis, cystitis, painful menstruation, etc. ), diseases of the skin (burns, frostbite, bedsores, eczema). Magnetic therapy is not recommended for patients with bleeding disorders and pregnant women. Therapy magnetic fields can be performed at home. It uses a portable hand-held devices (biocorrectors). With their help it is impact on certain areas of the body. To the home of magnetic therapy there are no contraindications, however, before applying it is necessary to consult a doctor. The procedures need to strictly follow the instructions and do not exceed the time of exposure to magnetic fields. If joint disease is cartilage destruction and replacement of its bone, leading to pain and deformities, reduction of active actions and even lack of movement. To treat arthritis can special diets, medications, surgeries, but there is an alternative method — magnetic therapy, which is beneficial for health. Select the appropriate device for the magnetic therapy: the stationary camera, email or regular magnets. 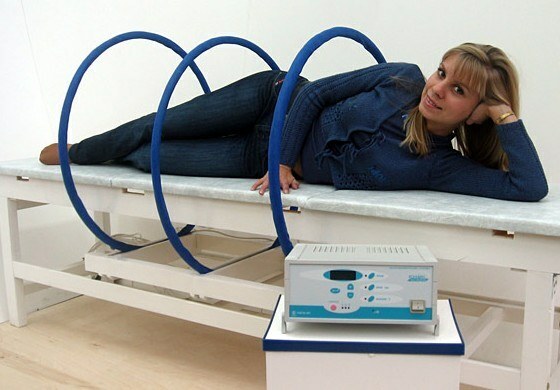 Inpatient apparatus is performed on prescription and is exposed to a magnetic field of the inductor on the sore spot. Electronic devices must be applied to the joint. Their action can be carried out through clothing, a bandage and even a cast. Keep in mind that at the beginning of the impact device you may experience discomfort and pain, but in the future the General condition normalized. At home you can carry out treatment of conventional magnets. To do this, take a few magnets and massage them in a circular motion clockwise a sore spot. Led magnets to slowly, smoothly, slowly. Between skin and magnet need to put a piece of compress paper. One session of exposure should be about 5-7 minutes. Repeat the treatment with the magnet 1-2 times a day. Buy magnetic jewelry in the form of bracelets, rings, necklaces or magnetic records on a special Velcro, the magnetic belt. Such magnets are attached to the body and you can wear them as jewelry. Attach the magnet closer to the affected area: arthritis of the fingers — wear rings or bracelets, osteochondrosis — perfect magnetic belt. Remember that to start to wear magnets need 2 hours a day and then gradually increase the exposure time. At night magnetic jewelry and belts always remove. If wearing magnets you feel the pain, pick the less powerful. In summer, you can be hot from magnets as they have a warming effect. Treatment of joints the magnets be sure to increase water consumption, because they strengthen the kidneys, and treatment with a lack of water in the body will be meaningless. After a while you will notice an improvement in the General condition of the body because the magnet has an impact not only on one place but on the circulatory, nervous and immune system at the same time. Treat joints with magnets defined courses. However, there are cases when people do not feel the beneficial effects of this alternative method of treatment. Keep in mind that the experts of the world Health Organization does not recognize a treatment with magnets and magnetic therapy considered pseudoscience. That's why using them is better in case if traditional methods of treatment does not improve well-being or have contraindications to physiotherapy.